How many distance is to hometown? Mom, when do we back to hometown on our roads? Photo courtesy of Gordon Williams. Found on wall of Chinese restaurant in Australia. Hometown is just a front. The phone can reach is called long distance. I can assure you, that was Homotown. That sure was one way of sobering up in a hurry. By God! They speak English well for Australians. I suspect it is called the “QUEENS’ English”. Examples of what you may hear from your cheap Chinese GPS device. Can anyone else hear their own accent? When I converse in other languages, I am highly aware of my Australian accent, and seek to minimize. it. With varying degrees of success. Especially the long “aa” or “ee”. Can you pass the salt? I can’t reach it, because distances. Especially the Innisfail grown tea – Nerada. Pron: Nh rada. In innisfail they call it Neeh As in”eh” raaadaa. I’ll have the traffic jam on toast. @ILock 0439. Next time pass it to them like you are playing Rugby. That should instigate a food-fight. The people on the roads in China should get off them. They may get squished by a Tank. The sentence can not understand is called Engrish. Better than woman who cooks meat and peas in same pot very unhyginic. I like John Denver’s version of “Country Roads” better. 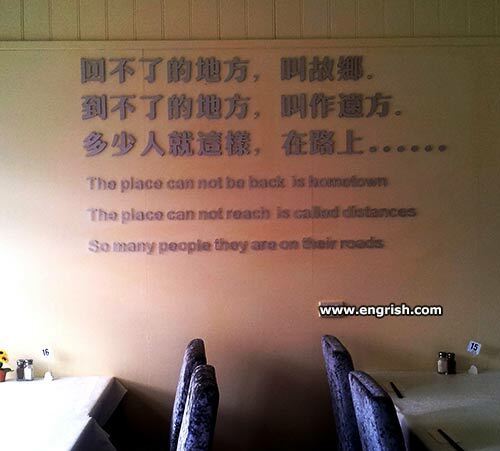 The place can not be back is front. The place can not reach is too high. So many people they are on their phones. When you come here for the Engrish, that’s Funky Town. The sign can not have is called grammar.